Something about this year's mild winter tells me that Punxsutawney Phil won't be seeing his shadow on February 2. Before the shadow reveals itself (or not), you've got a chance to experience a few Groundhog Day's with the curmudgeonly Bill Murray on the big screen at Citi Pond for our Winter Film Fest. You go to see Bill Murray -- not the movie he's in. No matter how mediocre the film, time spent with him is always rewarding. That absurdist deadpan has served him since the Carter-era "Saturday Night Live." And in his latest, "Groundhog Day," the shtick is still funny. For a time, the movie's pretty good too. 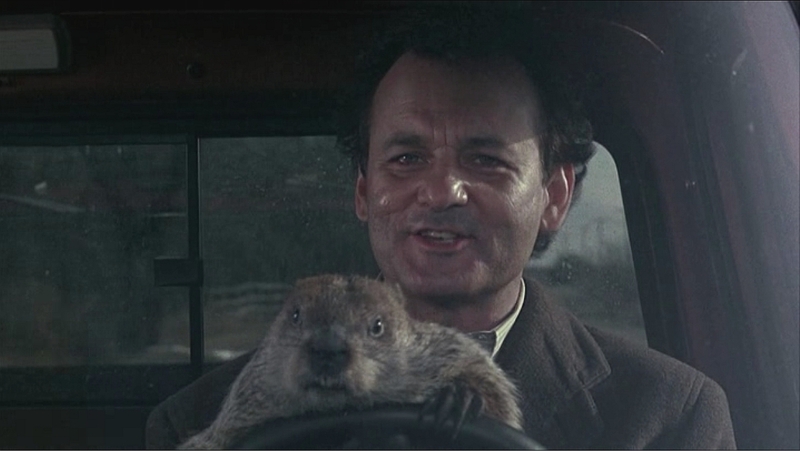 "Groundhog" will never be designated a national film treasure by the Library of Congress. But, in terms of vehicle selection, this is one of the better ones Murray has hitched himself to. In fact, its "Twilight Zone"-type premise (scripted by Danny Rubin and director Harold Ramis) is initially intriguing. A people-hating weatherman on a Pittsburgh TV station, Murray's waiting for his real ship to come in. "For your information, Hairdo," he asserts to a well-coiffed colleague at WPBH, "there's a news channel interested in me." Until that questionable possibility, however, he must content himself with such hated aspects of his job as the annual trip on Groundhog Day. For this inane (to his mind) festival, he must join the reporting flocks at Punxsutawney, Pa., to catch the yearly appearance of the spring-determining rodent. If the divining "Punxsutawney Phil" sees his furry shadow, six more weeks of winter are due. If he doesn't, the thaw is on. Now back for his fourth Groundhog Day, Murray -- with producer Andie MacDowell and cameraman Chris Elliott -- waits impatiently for the day to end. But this time, it doesn't. After a full day's work at the festival, Murray wakes up to exactly the same morning -- Groundhog Day II. The clock radio plays "I Got You Babe" like it did the morning before. An impending blizzard is announced once more. Stephen Tobolowsky, a horrifying nerd from Murray's high-school past now in insurance, recognizes him -- again. Even MacDowell and Elliott are gearing up to film the festival as if for the first time. Murray realizes he's stuck in time. No matter what he does, the next day is the same day. Only he remembers. This allows him to anticipate trouble. "Ned, I would love to stand here and talk with you," he tells Tobolowsky at their umpteenth chance meeting. "But I'm not going to." The time/space dilemma presents a variety of options, from fun to purgatorial. Murray is immortal, in effect. He can survive death games. He can teach himself piano. He can find out basic information from attractive local Marita Geraghty, for instance, then wow her the next time around with apparent inside knowledge. But he becomes increasingly interested in MacDowell and spends most of the time working on her. But he only has a day to impress her; it's back to square one at 6 the next morning. The trouble is, you'll feel like you've been through too many same days yourself. With its zany daily episodes, "Groundhog" gets stuck in a non-progressive repetition. It's also headed for the usual Hollywood Life Lesson, in which Murray's moral winter must thaw. But even through the most creatively frigid sections, Murray is amusing as he reacts to the longest day of his life. He gets to work on that recurring Tobolowsky meeting, for one thing. The best way to send the insurance agent screaming into the distance, Murray finds, is to embrace him for a suggestively long moment, caress his back and say: "I don't know where you're needed, but couldn't you call in sick?"